He concludes by praising the salubrious physical setting and its positive effects on everybody. People of property and fashion, who may wish for a while to breathe the air of the country, will find this a cool and pleasant retreat. Humanity will require of the Proprietor to bestow his most assiduous attention on the real invalids who may resort to the place. Those who are only comfortably sick, will however, by no means be neglected. By Theodore Edward Hook, Esq. 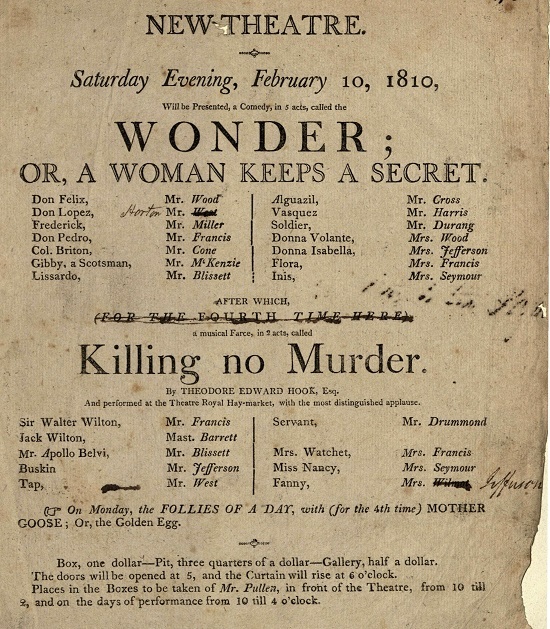 And performed at the Theatre Royal Hay-market, with the most distinguished applause. On Monday, the FOLLIES OF A DAY, with (for the 4th time MOTHER GOOSE; Or, the Golden Egg. Box, one dollar—Pit, three quarters of a dollar—Gallery, half a dollar. The doors will be opened at 5, and the Curtain will rise at 6 o’clock. Places in the Boxes to be taken of Mr. Pullen, in front of the Theatre, from 10 till 2, and on the days of performance from 10 till 4 o’clock. AT a period the most interesting our country has witnessed, since the establishment of independence; our national rights on the one hand outrageously assailed by the belligerents of Europe; our government, on the other, incessantly attacked by a domestic opposition designing to embarrass its most necessary measures, and impair its means of providing for the general defence, it becomes the duty of every faithful citizen to support the constituted authority of the Union…. The very idea of a misunderstanding subsisting between the general and state administrations, must diminish our national respectability and impair our energy; it possesses a natural tendency to encourage foreign nations to persevere in hostility, and to withhold that redress which a more judicious, and worthy policy would compel them to afford. 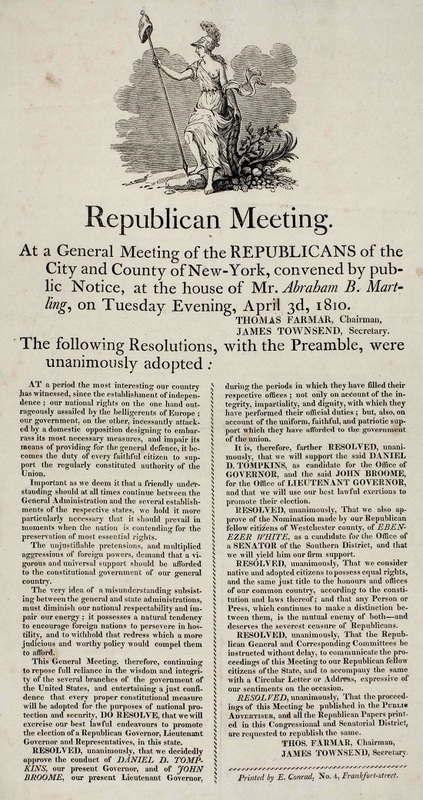 RESOLVED, unanimously, That we consider native and adopted citizens to possess equal rights, and the same just title to the honours and offices of our common country, according to the constitution and laws thereof; and that any Person or Press, which continues to make a distinction between them, is the mutual enemy of both—and deserves the severest censure of Republicans. 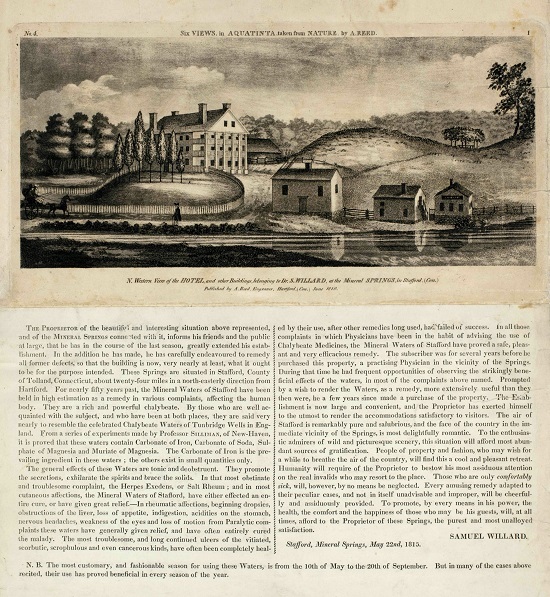 For more information about the Supplements from the American Antiquarian Society to Early American Imprints, please contact Readex Marketing.